As of Pt3, we had gotten the dropbar mtb assembled, now we can talk about the ride. First off, one of the primary reasons I wanted a dropbar on my mtb is so that I could get a lower hand position. It’s easy for a tall rider to do that with a flatbar because his seat is a lot higher relative to the top of the head tube, but I needed dropbars and a track stem to do that. Also, I just never found the wrist position of a flatbar comfortable under vigorous, sustained riding. My dropbar mtb solves this. Granted, the low, somewhat forward position isn’t the best for crazy technical singletrack, but I always envisioned my offroad riding as being more fire road cruising than big hit bashing. In practice, I ride the drops about 90% of the time on the road, and 50% drops /50% hoods offroad. I almost never ride the flats near the stem. The bike has proven itself as an excellent crosstraining tool. Since I ride mostly in the drops, I can switch to my roadbikes and ride more comfortably in their much lower drops. However, my spin technique is rubbish if I don’t balance the mtb riding with some quality time on my fixie. Compared to the alternative brake systems discussed in Pt1 & 2, the Shimano cable disc set-up is superb. I highly recommend the Shimano mechanical disc brake for road levers, the BR-R505. I did upgrade to the RT-96 rotor which is a little more consistent than the caliper’s stock accessory. After initial break-in period, the brakes have given excellent service. Unlike previous attempts at mating dropbar levers with cantis or v-brakes, I can set the mechanical disc brakes up the way I want them, with a fair bit of lever travel before the pads hit yet with plenty of power and modulation. Why would anyone want a lot of lever travel? If you have small hands, you’d notice that you can’t really squeeze the levers hard until the lever is cocked in already. A lot of mechanics don’t know this and always set up the brake pads a hair off the rim on road bikes, but small-mitt riders should really consider having their bike set up differently. The shifting still has some issues. The 44/32/22 crank and 10sp 12-27 has a plenty of gearing options, but the rear derailleur has been a little less than satisfying in performance. I think maybe the Tiagra rear derailleur’s return spring could use a little more oomph and/or perhaps better ferrules for the shifter housing might make the cable tension more consistent. The front derailleur moved by the bar-end works adequately, but the chain is over-eager to overshoot the middle ring when coming off the big. I actually raced the bike at Star-Crossed, the first cyclocross race of the season. I am no cross pro by any stretch of the imagination, but the bike was perfectly adequate for the race. It may have been my natural grace on a bicycle that gave me excellent handling in the corners, but it is more likely that the bike’s extra traction. The bike’s portly 24.5 lbs was most definitely not an advantage though. However, if I was going to race a whole season, I’d rather do it on my mtb than go through the hassle of buying and dialing in a new crossbike. If you had a hardtail mtb with disc mounts, I recommend that you consider my dropbar mtb recipe for racing cyclocross. You could swap out handlebar/levers and easily race mid pack in the Cat4s with the same bike you raced Norba in the summer. You wouldn’t have a UCI approved bike (tires wider than 35mm and disc brakes), but at the Cat4 level who cares? 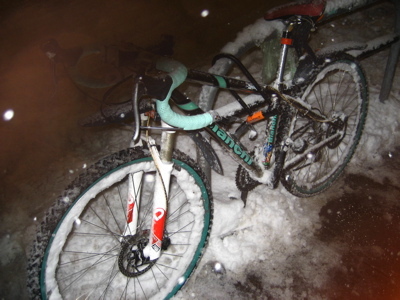 The winter solstice on Sunday night was the most fun I can remember having in the snow. 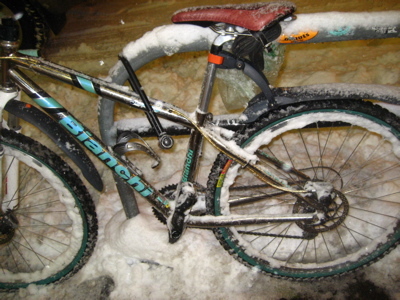 I had always thought that this project bike might really shine in the snow, but who could have known that Nature would have obliged me to that extent? I switched the Michelin XC-Dry 2.0 to old Geax Blade 1.85” mud tires. The smaller footprint of the Geax was a disadvantage on the soft powder, but they shed snow better than the other tires. I got some Schwalbe Snow Spiker Pro tires today so that I can deal with the icy refreeze. Just in time too, since I’m going over to Byron’s for dinner in a half-hour. He and his family have been stuck for days at the bottom of a short driveway at the top of a very tall hill, all covered in snow. Let’s hope that dinner is more like A Christmas Carol and less like a soccer team stranded in the Andes. In the next part of this series, I’ll tell readers about my future plans for this bike.